Erg Chebbi and Fez Tour - Luxury Riad in Marrakech, Morocco. Book Erg Chebbi and Fez Tour Today with Hip Marrakech - specialists in English Speaking Accommodation in Marrakesh, Morocco. "Our uniquely curated Desert tour not only offers adventurous travelers the chance to taste the Sahara’s grandeur at Erg Chebbi, but it also offers the opportunity to sample the delights of Fez, the countries oldest imperial city and a centre of culture and learning." Our uniquely curated Desert tour not only offers adventurous travelers the chance to taste the Sahara’s grandeur at Erg Chebbi, but it also offers the opportunity to sample the delights of Fez, the countries oldest imperial city and a centre of culture and learning. In-between Marrakech, Erg Chebbi and Fez, you will also have an opportunity to explore the diverse Moroccan landscape and fascinating Moroccan history. En route to the golden sands of the Sahara, you will cross the majestic Atlas Mountains; visit the UNESCO heritage of Ait Ben Haddou; the dramatic Todra Gorge; and a plethora of historic oasis towns, each with their own unique stories. On the route to Fez you will visit Medilt, Azrou and Ifarne. These colder, wetter reaches of the Moroccan mountains offer a unique bio-diversity, European-style architecture and, at some times in the year, even snow. Of all the deserts in Morocco, the Erg Chebbi dunes at Merzouga are by far the most majestic, and our Erg Chebbi and Fez Tour is an excellent opportunity to experience this sublime isolation of the Erg Chebbi dunes first hand. Staying in one of two secluded desert camps, you will spend the night under the stars in Berber tents, listen to traditional folk music by campfire and enjoy your evening meal under the clear night sky. Indeed, after sun set the sublime isolation of the desert transforms the night sky into a wonderful light show. Stars shine brightly, the Milky Way glows over the dark dunes, and, if you are lucky, you may even spot a shooting star. Add to the mix a superb sunrise and a camel trek, and you have memories that will last a lifetime. Please note: If you are interested in visiting Erg Chebbi, but would like to return to Marrakech rather than continuing on to Fez, then we offer this option on our Erg Chebbi Sahara Tour . Here at Hip Marrakech we have personally curated this unique Desert Tour to Erg Chigaga, utilising years of experience and a wealth of local knowledge. If you are pushed for time or would like to explore more of Morocco, our dedicated team is on hand to tailor and alter any tour or trip to fit your budget, time constraints and desires. Make contact today and see what we can do for you. If you would like to find out more about the tours, trips and excursions we offer, or if you would like to make a booking contact us at info@hipmarrakech.com. If you prefer to speak to our reservations team please do not hesitate to call + 44 (0) 207 570 0336. Price: from £595 per person. 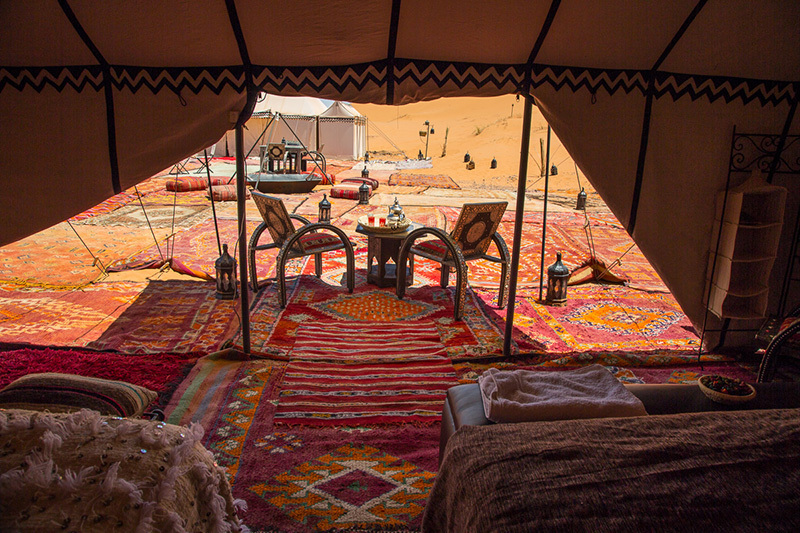 Upgrade to the Luxury Desert Camp for only £100 per person. 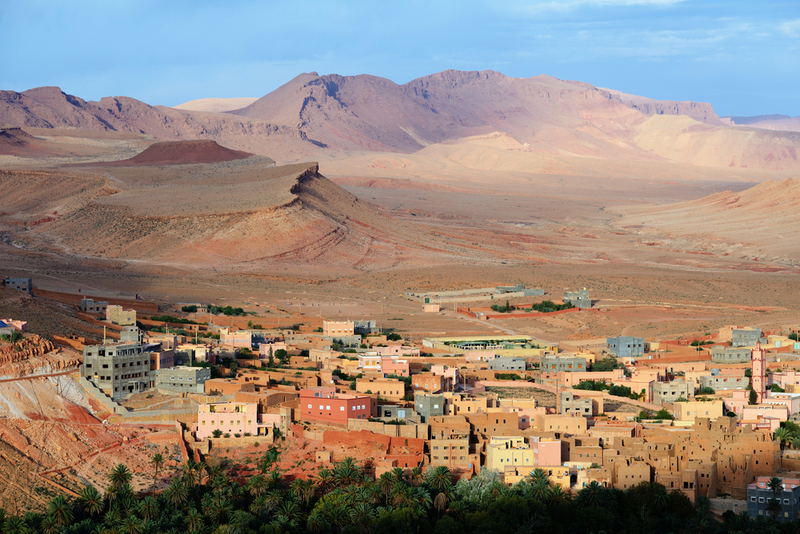 Depart from Marrakech, crossing the Atlas Mountains to Ait Ben Haddou via Telouat and Valley Oulina. Overnight stay in Skoura. Bright and early at 9.00am, our driver will meet you at a dedicated pick up point close to your accommodation accommodation in the heart of Marrakech. From here, you will drive southwest towards the majestic Atlas Mountains. The Berbers call the Atlas range idraren draren – “The Mountains of Mountains” – and it is easy to see why. As you leave the hustle and bustle of the red city behind you, the omnipotent Atlas Mountains stand tall as an unmoving monument, dominating the skyline, stretching as far as the eye can see. 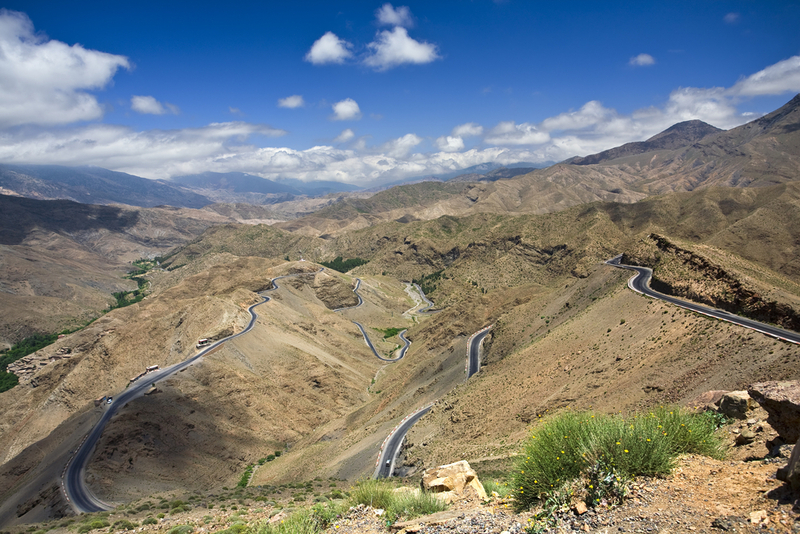 As the road starts to curve and climb up the Atlas range, the scenery begins to change offering stunning panoramic views of lush valleys and arid gorges, peppered with small earthen Berber villages and dazzling minarets. However, the site which offers the most stunning views and the most amazing photo opportunities is the Tiz n’Tichka pass, your stop for lunch. Reaching an elevation of over 2,000m above sea level, the Tiz n’Tichka pass is the highest mountain pass in North Africa and offers amazing 360 views of the surrounding Atlas Range. If you are travelling from November to March, snow can often fall on the pass, but it is usually warm all year round thanks to the bright Moroccan sun. After passing the Tiz n’Tichka, you will join the main road between Marrakech and Sub-Saharan Africa. This former caravan route that was once used to trade gold, salt and slaves and traces of this industrious and prosperous past are easy to find. Along this stretch you will be invited to stop off at Telouat – an old Kasbah that once functioned as the seat of the powerful El Glaoui family, who ruled Marrakech in the years leading up to Moroccan independence in 1956 – and The Ounila Valley – a narrow-sided, fertile river-valley that once served as the main route over the Atlas Mountains between the French protectorate constructed the Tiz n’Tichka – before heading to Ait Ben Haddou – a fortified city, or Ksar, that was once the main trading post on this route. Ait Ben Haddou offers a great example of 17th Cent. earthen clay architecture, a style which was very popular across southern Morocco. This traditional beauty has not gone unnoticed: the city of Ait Ben Haddou was made a UNESCO world heritage site in 1987 and has also been used as a set for many films and TV series, including Babel, Prince of Persia, The Mummy, Gladiator, and, more recently, Game of Thrones. From here you will progress on to Skoura, your resting place for the night. Unspoilt from mass tourism, Skoura offers a tranquil spot for relaxation and laid-back, guide-free exploration, set amongst fertile palm tree groves ancient Kasbahs including Amerdildil Kasbah, which can be found on the front of the Moroccan 50dh note. Travel from Skoura to the Todra Gorge, then onto Tinghir for your overnight stay. Day two starts with a trip to the Todra Gorge, a dramatic canyon cut into the eastern side of the red-hued cliffs. Here you will have the chance to explore the gorge via an easy-to-maneuver stony track, which runs through the canyon. Local tourists usually out-number international tourists here, so expect a laid-back vibe. The last 600m of the Todra Gorge are by far the most spectacular: the canyon narrows to around 10m and the gigantic, smooth rock walls reach 160m into the sky, blocking out the bright Moroccan sun. The effect is truly sublime. As you head away from the Todra Gorge to Tinghir, the landscape becomes noticeably lest dry and more green. This is because Tinghir, your home for tonight, is set in the center of one of the most attractive oases in Morocco. You will arrive at Tinghir with ample time to explore the area. If you head to the eastern edge of the town, you will find a palm oasis that shades a number of crumbling Kasbahs and an abandoned 19th cent. Medersa (Islamic College). We also recommend the ruins of Ksar Asfalou, an ancient fortified structure to the north of the city. Travel from Tinghir through Efroud, Risani and Merzouga to Erg Chebbi for your overnight stay in the Sahara desert. En route to Merzouga, your entrance to the desert, you will have the chance to briefly explore two small Oasis towns, Erfoud and Risani. Perhaps the more interesting of the two is Risani, which was once the famed capital of the desert (Sijilmaa), where fortunes in gold and slaves were traded. Today, thanks to the harsh weather conditions and a change in fortune, Risani does not shine so brightly. However, this picturesque city has gained recent popularity as a destination where visitors can still experience the authentic mystique of Morocco. Upon your arrival at Merzouga, you will begin you trip into the Sahara. As you leave the main village, the golden dunes of the desert seem to rise out of the black Hamada rocky plateau, until you are surrounded by a sea of sand at every angle. This is the desert experience; exactly as you would imagine it. It is here, secluded in the sands of Erg Chebbi, that you will stay the night in an authentic desert camp, sleeping in private Berber tents fitted with proper mattresses, sheets and blanket. During your desert experience you will be given the opportunity to trek across the sands on a camel; taste your delicious evening meal around a campfire, set to the backdrop of traditional folk music; and enjoy a refreshing breakfast as the sun rises across the Saharan sands. To make your stay extra special, why not upgrade from to the Luxury Desert Camp for only £100 per person? Fabricated with handcrafted furniture and soft textiles, each tent has been carefully designed to offer the highest comfort and luxury. The tents are very spacious, over 25sp m in size, and come complete with either a king-sized bed or two single beds and an en-suite bathroom facility with shower, flushing toilet, hand basin and running cold and hot water – quite a rarity in such a secluded location. The Luxury Desert Camp also includes Sandboarding and ice-cold beverages, fresh fruit and snacks served at any time. 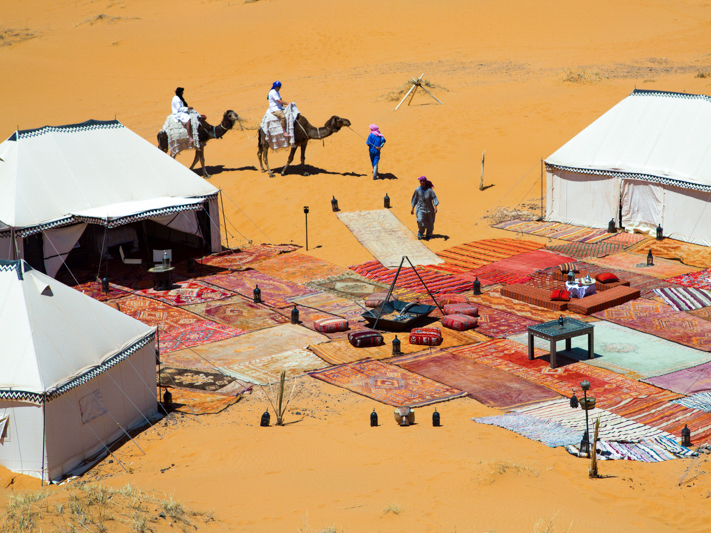 For more information on both the Standard and Luxury Desert camps, don’t hesitate to contact us today on + 44 (0) 207 570 0336 or info@hipmarrakech.com. Travel from Erg Chebbi, Merzouga to Medlit. After spending a magical night in the Sahara desert, you continue the tour to Midelt. The road to Midelt offers some breathtaking views of the eastern High Atlas Moutains, which seems to rise out of nowhere. Historically, Midlet has functioned as a convenient spot for traders of gold, silk, slaves and salt to rest. Today, it still exists as a convenient spot for adventurous travellers to rest, heading or coming back from the Eg Chebbi dunes. Midlet is home to a number of restaurants and the Souk Jhid, where quality hand-made Middle Atlas Berber carpets and rugs are sold – the perfect souvenir. Travel from Medlit through Azrou and Ifrane to Fez. As you leave Medlit and head across the Middle Atlas Mountains, the landscape and architecture begin to change, offering a different side of the Moroccan experience. The first notable town of the middle Atlas is Azrou, and it indeed makes an attractive introduction to the area. Unlike the dry, arid landscape of the preview four days of the tour, Azrou has a rich biodiversity. The town is surrounded by green oaks and cedars and is home to the endangered Barbary Macaque Apes and beautiful butterflies that unique to area and not found anywhere else in the world. The stunning scenery and sweeping views of cedar and pine forests and flourishing hillside meadows continue and you climb the Middle Atlas up to Ifrane, the second stop of the day. Ifrane is one of the only places in Morocco where you will see slanted roofs, a necessity thanks to heavy winter snowfall. (These roofs are made from green-glazed tiles – a colour and style closely linked to Fez, and perhaps a precursor of things to come.) Indeed, due to this seasonal snowfall and remarkably European style of architecture, Ifrane almost feels like an alpine-style resort and is often referred to as ‘Morocco’s Switzerland’. Interestingly Ifrane is very popular with Moroccan tourists, who flock there to experience the “European Winter” during the colder months. After observing life in Moroccan’s rural communities, your tour will continue to Fez, one of the country’s oldest imperial cities. Much like in Marrakech, we strongly encourage you loose yourself in the medieval labyrinth of small, winding streets in the traditional Medina, FeZ el Bali. There are also many interesting museums, palaces, and monuments showcasing the history and culture of the city; there is so much to see and do! 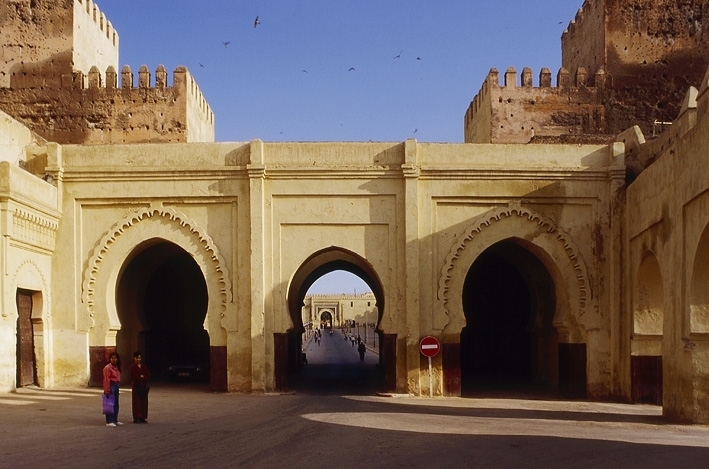 Fez is the last stop on our Desert Tour, if you require accommodation have a look at the range of hotels and riads we offer here.